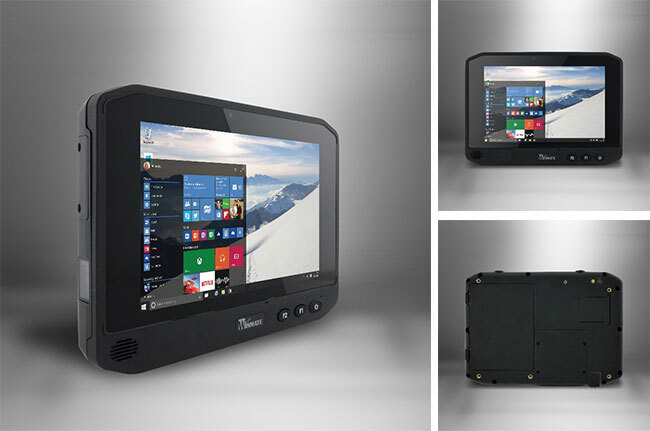 With the M800BW, Winmate offers a small and handy modern Windows-based tablet computer that's rugged enough to be used in vehicles and in the field, light and handy enough to be mobile and easily carryable, flexible enough to function as a standalone device or as part of a well-connected vehicle system, and competent enough to be used for all sorts of data collection, control and management systems in public safety and numerous other fields. It runs Windows 10 IoT Enterprise or Windows Embedded 8.1 Industry Pro on a reasonably quick quad-core 1.60GHz Intel "Braswell" Pentium N3710 that can reach burst speeds of up to 2.56GHz. It can also accommodate up to 8GB of RAM. Its 8-inch capacitive multi-touch display with 1280 x 800 pixel, the M800BW is small, handy, rugged and sealed to IP65. IP65 sealing means the M800BW is totally dust-proof and can also handle not just rain, but low-pressure water jets from all directions. It doesn't mind hot and cold, with an operating temperature range of 14 to 122 degrees Fahrenheit. There's an optional 1D/2D barcode reader, a real industrial-grade scanner and not just the internal camera with an app. RFID/NFC and smart card reader are available as well. And for positioning, its u-Blox GPS can track the satellites of three of the available GNSS systems concurrently.